Junnar, the birth place of the Maratha Chieftain Chatrapati Shivaji, is 177 kms from Mumbai on the Mumbai- Aurangabad route. Situated in Aurangabad district of Maharashtra State, Junnar is also an important destination for the Buddhist pilgrims. Junnar as a Buddhist Center during the Satavahana and Kshatrapa periods between the 2nd BC and the 3rd BC. The hills Shivneri surrounding the plains of Junnar are honeycombed with a cluster of about 50 buddhist caves, which are divided into three distinct groups. Surrounded by lush greens, these caves are cut into the cliffs on its east flank. 5 kms to the west Shivneri are the Tulija Lena Group. These caves here span the Satavahana and Kshatrapa periods. They consists of 11 excavations. 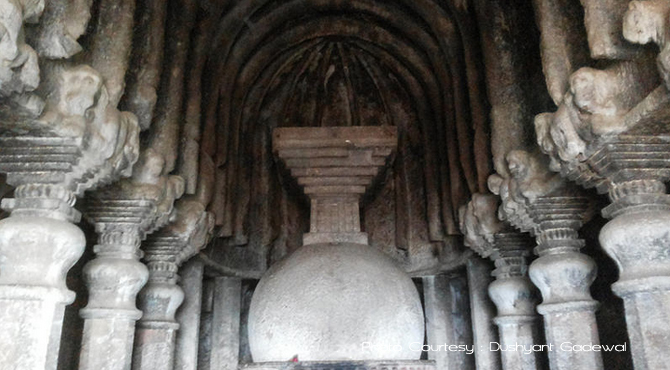 Cave 3, is the most important which has a circular dome ceiling in the Chaitya Hall with 12 tall octagonal pillars. It's roof is like a rock cut dome. The second group of caves are located 1.5 kms southwest of the Junnar town towards the Manmodi Hills. These group of Caves were known as Gidha - Viharas. It boasts about 50 or so excavations, four are Chaitya halls. They are located in three distinct groups known as Bhimasankar group, situated southeast of Manmodi hill, Amba-Ambika group to the north of Bhimasankar and Bhutalinga group situated nearly 200 m west of the Amba-Ambalika group. Cave 40 is the largest and has a well preserved facade. The third group, Ganesh Lena Group is located 4 kms south of Junnar. There are 26 excavations in this group, two of which are chapels, the others being monasteries. the principal being the Chaitya Cave No.6 and the Vihara now known as the Ganesh Lena. The main facades is marked by a blind chaita arch. Cave 7 has a verandah with doorways and windows. The octagonal columns have bell shaped capitals and seated animals. One of the most important historical monuments in India, Ellora caves, cut out of the vertical face of a high basalt hill, Charanadari running north to south in the Deccan, was designated as a UNESCO World Heritage site in 1983. These caves are the culmination of Deccan rock-cut architecture. Read more.. Located on a pyramid shaped hilltop to the north - west of Aurangabad, Daualabad fort is considered as one of the most spectacular forts in Maharashtra. Overshadowed by a rock that rises 183 m above the plain, Daulatabad Fort is considered as one of the most coveted forts of India. Read more..
Ajanta caves, designated as a UNESCO World Heritage site, holds masterpieces of Buddhist religious art, considered the finest examples of architecture. These historical manmade caves containing paintings on the walls and ceilings primarily depict the life of the Buddha before his enlightenment. Read more..